A church youth program is nothing new. Yet when four churches of different denominations band together to create a program, that is “something new in town,” according to Sandy Johnson, pastor of the Boulder City United Methodist Church. Johnson, along with Jenifer Jefferies of St. Andrew Catholic Community, Patty Jacobson of St. Christopher Episcopal Church and Francyl Gawryn of Grace Community Church, are the women behind this new youth program that will “promote leadership, fellowship and service for students in sixth to 12th grade,” the Methodist church’s news release said. This venture, according to Johnson, has been “a collaborative effort” that has been formulating for the past six months. 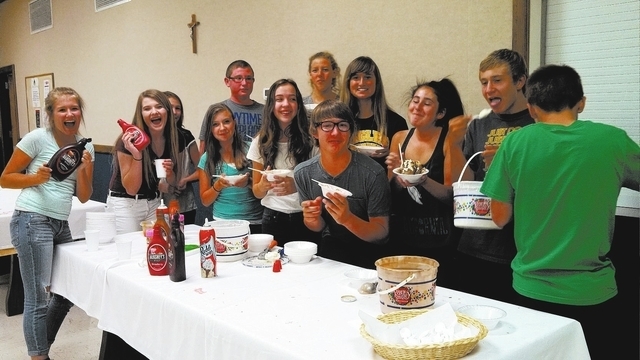 To kick off this “coming together,” the four churches will host an ice cream social at 3 p.m. Sunday at the Senior Center of Boulder City, the United Methodist Church’s current meeting place. The event is free and open to all interested young people, as well as parents. Johnson would like to see the kids give this new program a name or title that they develop as well as plan activities and service projects. “I want this to be something that is beneficial to the kids, beneficial to the community and not your run-of-the-mill youth group. I want to teach Christian principles through actions, not through Bible studies,” Johnson said. Johnson said it is the “coming together” of the various faith-based groups that is important. “We don’t need to stay in our own little pocket of ‘well, we’re Protestants, we can’t play with the Catholics or we’re Episcopalians, we can’t play with the Methodists,’ ” Johnson said. Gawryn added, “I hope it will help them (the youth) to learn to cross religious boundaries in making friends and in showing hospitality and grace to those whom they are meeting for the first time, whatever their faith tradition might be. “The more chances our teens get to meet and know each other, the greater opportunities there are for friendship and fellowship to develop among them, especially between the different faith organizations,” Gawryn said. “I want people to know there is something new in town, and there is an opportunity for kids to be involved” that is not sports or school, Johnson added. Although the adults have a first activity planned in November, attending “Life in Death: Day of the Dead” at the Winchester Culture Center in Las Vegas, future events, projects and activities will depend “on what the kids want to do,” Johnson said. Her only concern was that the actions have “some depth” to them. There has been discussion about caroling during December and distributing cookies to the businesses on Nevada Way, movie nights, a camping trip, service projects and fundraisers. What happens in the future, though, will be up to the young people who attend the ice cream social and future monthly gatherings. “I’m looking forward to getting to know some of the other teens in Boulder City, hearing what’s going on in their lives and letting them know that there are people out in the community who are watching out for them,” Gawryn said. For further information about Sunday’s ice cream social or the youth group, call Jacobson at 702-293-4275, Gawryn at 702-293-2018, Jefferies at 702-293-7500 or Johnson at 702-293-7240.